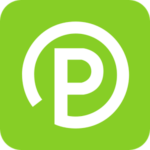 Now Available: Park by phone by downloading the Parkmobile App. Suggested Use: If you need to extend your meter time, pay for the first two hours by credit card: enter the parking zone (on green label on parking meter) into your park mobile app, for later use. If you need to exceed the 2-hour limit on your parking meter, simply activate your park mobile app and add time - up to an additional two hours. Questions about parking and purchasing permits? With over 7,000 daytime employees, managing parking in our historic downtown is challenging. Parking meters are designed to create a regular turnover of spaces, making convenient parking available on every block for those who choose convenience and are willing to pay more for that convenience. On-street parking is metered at $1.50 per hour, with a current limit of 2-hours. 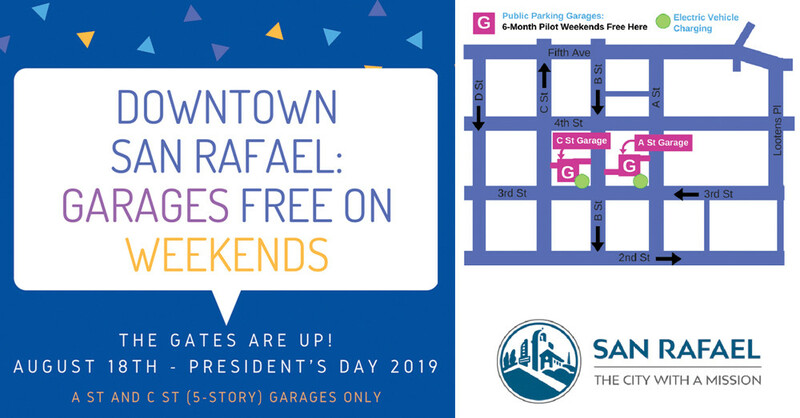 Downtown has two convenient garages, and the first hour in the garages is free with a parking validation from downtown merchants. Parking lots, scattered throughout downtown are the most affordable option, at $.75 per hour. Do yourself a favor and avoid a citation for an expired meter by parking in a garage or parking lot. Purchase a frequent-parker card, which gives you parking in garages for 50 cents per hour! Frequent Parker Card: $25.00 p/card. (For City garages at A & C Streets ONLY). Card gives 50% off parking rate for 12 months. If you park 5 or more days per week, purchase a Monthly Parking Permit. The City of San Rafael has electrical vehicle chargers available to the public in three (3) parking locations. The EV chargers, located in our parking facilities at 3rd/A St., 3rd/C St. and 3rd/Cijos St. lot, are available for free to any of our parking customers. Customers visiting a downtown business are encouraged to use the vehicle chargers, which are part of San Rafael’s continuing commitment to reduce greenhouse emissions. 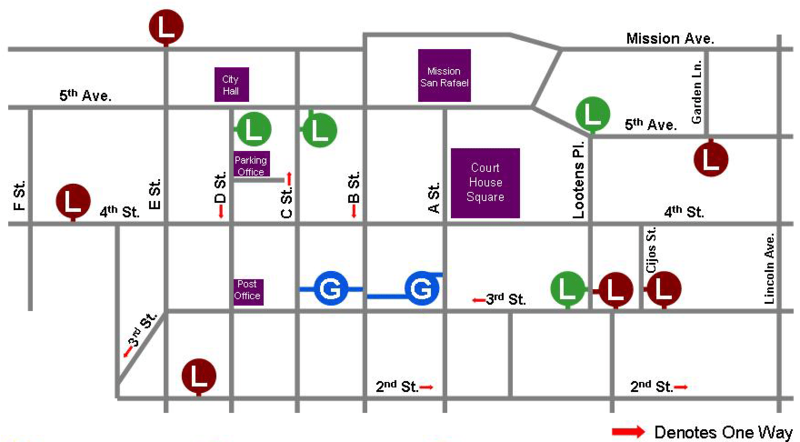 Additional information, including links showing station location, availability and cost is available on Map of Downtown Parking above. For information about Electrical Vehicle Chargers in San Rafael, including location, availability and cost, click on any of the following links. Smart phone applications such as Plug Share and Recargo are also sources for electrical charger information. The charging stations are located in the garages as indicated on the map with the "G" symbol.